Welcome everyone (except Mackem B's) to the Florida Magpie Supporters website. There we are, standing amongst the Clematis in Leicestershire on the morning of the FA CUP, 1999. We stayed the night with the local Apholsterer Extraordinaire, AJB, so our journey on the day would be shorter. It was an uneventful drive to Wembley, if you don't consider the endless (should I say mindless) barrage of profanity and low-intelligence of some MANCS at a Granada - guess they didn't like my hair! And then there's the wrong turn I took at a roundabout at the end of the motorway, and ended up heading straight into London instead of TOWARDS Wembley. But we made it eventually and started our day. Read more about our Wembley experience here. 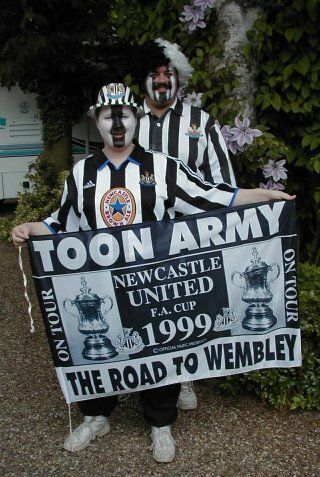 See our Toon Army Photos from the DC 2000 team Trip. You can always drop a note to Cyndi or Myself and we will try to reply promptly. As always, please give us notice if you are heading 'over the pond' to the Disney area and we'll try to give you a heads up on any special things of interest (like the best deals on pints and where to watch the footy!). ...Except for the parts that were stolen from some other website. Those parts are still copyrighted by their owners, whoever they may be - we've stolen so much we can't keep track of it. All photos are copyrighted by their respective owners... but like most things on the web, they can be stolen as well and there's generally no way anyone can ever find out. Speaking of stealing, how about the way Dietmar Hamann stole from us by signing with us and then breaking his contract - what a Loser!